Home Alternative Voice ¡Felices Fiestas! It’s Christmas time. And has of course been so since the end of September. Now that we are all moaning about the rain instead of the vicious heat we can start wishing each other a “Merry Christmas,” or if you are a not particularly well-meaning idiot, you could say “Happy Holidays” instead so as not to oﬀend anyone who draws comfort from a diﬀerent imaginary friend in the sky. This is bound to make you feel good about yourself and will inevitably bring harmony to peoples of all cultures, and an end to wars. If you are a right-wing lunatic you could rant about the supposed “War on Christmas” which anyone with half a mind can see that Christmas is winning with great ease. Christmas of course ceased to have anything to do with religion a long time ago, probably not long after the entire story was appropriated from pagan myths. Unless of course consumerism has oﬃcially become a religion in which case surely all those massive online and high-street retail outlets should be given charitable status, as well as the tax breaks which help them to create the wealth which is trickling down so slowly it can only be measured in terms of thousands of centuries. Nevertheless despite the ongoing proletarianisation of the middle classes, and the semienslavement of the working classes, everyone likes to splash out at Christmas. None so much as the good people of Madrid who bring the city centre to a standstill for most of the period. The queues for the Christmas lottery tickets alone encircle the globe many times over. It is hell on earth which is perhaps as it should be. The lottery is an integral part of the Madrid Christmas experience. It is based on an entire nation’s lack of understanding of the basic mathematical principles of probability. People get very excited when the winning ticket has been bought in the city in which they live, even if that city has several million inhabitants. Some people buy two tickets so that their chances of winning will rise to about one in 20 million. Others cunningly buy their ticket from the shop which sold the winner last year, a shrewd move and an obvious path to unfathomable wealth. More commonly entire micro-sections of society share tickets, or participations in tickets. In the run up to the big event one is constantly harangued by work colleagues, sports clubs, neighbours, and local bars to buy a share. This plays havoc with people who have a passing acquaintance with the laws of mathematics but are nevertheless haunted by the primeval fear of what it would feel like to be the only one who hadn’t bought part of the winning ticket. It would feel like being an astronaut who has been accidentally jettisoned from the space station and is drifting slowly, and terrifyingly alone into the eternal darkness of the universe. The lottery is also noisy. Those nasty precocious little kids who sing out the winning numbers, their voices raised in a frenzy of greed-fuelled emotion as the prizes get bigger and bigger. 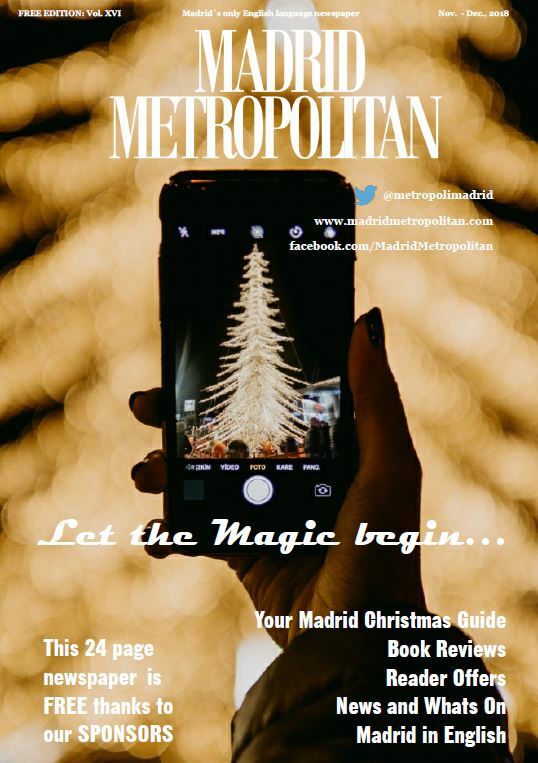 For some Madrileños this is the very essence of Christmas. Apparently little old ladies go mad for this kind of thing. Or maybe this is just another manifestation of the patriarchy, and as cultural warriors bring about an end to all kinds of rampaging privilege, perhaps one day I too, freed from the shackles of my gender, will come to love the horrible warbling little bastards. The sound of piped Jingle Bells has long been considered a mitigating factor in mass murder, but the Spanish have their own vicious little ear worm. La Mari Morena becomes the sound of the town forcing people like me to wander the streets buried beneath powerful headphones listening to Disorder, Anthrax, and Motorhead at levels that will blissfully guarantee permanent hearing damage. Many people believe that Christmas is all about the family. It certainly is in Spain. Between December 24th and January 6th anyone unlucky enough to have Spanish relatives will be submitted to no less than ﬁve full family dinners. It is of course a great time for alcoholics, as alcohol is the only way to get through the whole gruesome nightmare of gluttony, and ancient seething blood feuds. No one can irritate you like your own family. This is because you have grown up with them and they all know exactly what you are like, so manners, respect, and pretence go right out of the window. These are the very same forces that make long-term relationships such drudging sexless aﬀairs. Very few people are amusing to their immediate family and long-term lovers. They’ve seen and heard it all before, and are probably consumed by all manner of festering grievances. Slap bang in the middle of it all we have New Year’s Eve. In England this is traditionally celebrated by mass violence in pubs, car parks, taxi ranks, and kebab shops. However, in Spain it is inevitably centred once more on the family. Having stuﬀed yourself for a week, following the usual ludicrously lavish meal washed down with buckets of cava (Catalan if you actually like cava, Extremeño if you’re a fascist), you are then expected to eat a grape for every chime of the bells leading up to midnight. That’s twelve grapes in twelve seconds. If you really are an idiot you could cram yourself into the Puerta del Sol with lots of other brain deﬁcient revellers and wave a silly laser about. Most Madrileños however like to watch it on TV guided by increasingly annoying male and female presenters, he dressed in a tuxedo, she barely dressed at all. The grapes apparently bring good luck, except for the statistically inevitable individuals who actually choke to death on them. And anyway, it’s a tradition, which goes all the way back to the 1920s when the King decided it would be a good way to ﬂog oﬀ the excess grape harvest. As always tradition simply means having done any old shite for quite a long time, or at least for long enough for traditionalists to invoke the word as some kind of profound justiﬁcation for stupid, and often moronic behaviour. (see nearly all local village ﬁestas). Thankfully the Spanish Christmas does ﬁnally stagger to an end on January 6th when Spanish kids get yet another haul of presents from usually older relatives still in thrall to tradition despite the ongoing collapse of the economy, as the demographic time bomb detonates to the backdrop of Neo-liberal madness. It is the day of the Magic Kings. It is also the day when venomous identity politics is unleashed from left and right alike as an increasingly bitter annual controversy centres on King Baltazar who is supposedly of a minority ethnic group. How this imaginary ﬁgure is to be accurately represented has become a burning issue. Traditionalists believe that the baby Jesus would have originally been gifted the myrrh by a middle-aged white politician covered in black shoe polish. Progressives who don’t even believe in all this shite anyway, still feel strongly that he should be represented realistically by someone with proper dark skin. The black beard is thankfully no longer an issue as every male in Madrid over the age of 14 now has a full black beard. No one seems to care about the authenticity of the myrrh. And with the increasingly spiteful King’s Parade at an end, the festive season is ﬁnally laid to rest, along with many of the victims of its excesses. The rest of January is of course a hideous aﬀair of self-control, and detoxiﬁcation. But at least it’s not Christmas. And it won’t be for another six months. So Dear Reader, I wish you oodles of festive fun. And remember that your relatives probably despise you as much as you despise them, so be kind, if not gentle. Enjoy the food, and the drink, and remember that if we all stop consuming the planet will explode, and we will all have to forage for food, and phones, and there will be no more wellness coaches or avocados. ¡Felices Fiestas! Next articleChinese Ban Winnie the Pooh from Madrid!